Don’t have time to arrange a visit? Get a quote with our free video survey app. We appreciate many of our clients have busy schedules therefore along with being able to arrange a home survey the Moving Partnership can offer customers a video survey using your smartphone or tablet. 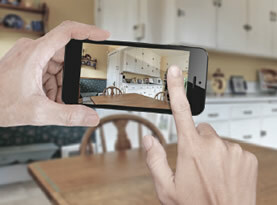 One of our Moving Consultants will guide you through the moving procedures using your devices camera. The video survey is free and can be arranged at a time to suit yourselves please contact our sales office to arrange an appointment or fill in the ‘Please Contact Me’ form to the right. "Excellent service second to none"